Airbrushing is a great way to apply paint. I first started airbrushing in the summer of 1972 when I got my first airbrush – it was a Paasche H or 3 in 1 single action. I was able to purchase a used CO2 tank and an old regulator at a welding supply store. The airbrush worked great with the Testors enamels I used at the time. Although I did have to clean the airbrush frequently as it was constantly getting clogged. The smell in my bedroom got pretty bad too as I had no spray booth – just a cardbord box. Now I wonder how many brain cells I killed painting like that. Whenever you paint you need to take precautions. 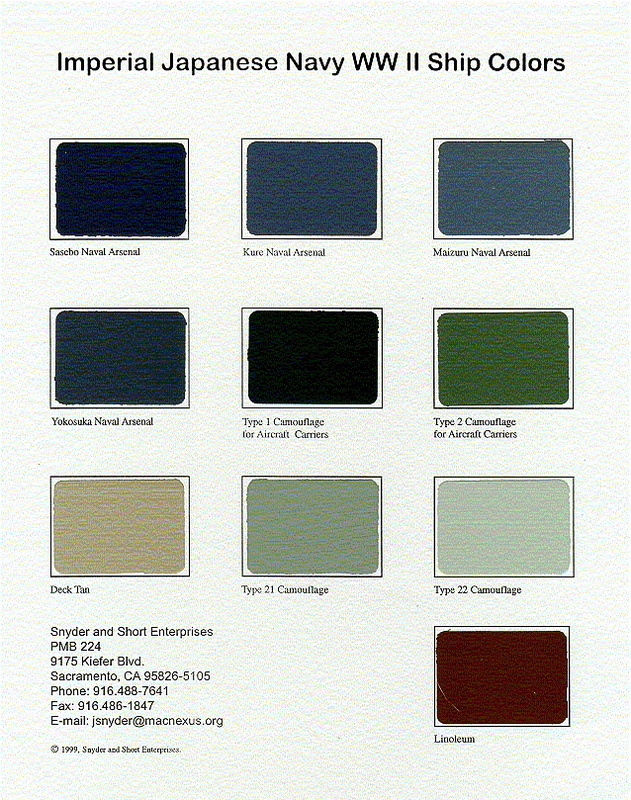 Paint fumes can result in eye and respiratory irritation, headache, dizziness, and even memory problems. Some of these compounds have been shown to cause cancer in animals and are suspected of being human carcinogens. Some studies show that exposure to paint fumes can also increase the risk of asthma. So be wise! Fast forward 36 years and I now use an Iwata HP-CS double action airbrush – which is just fantastic. I can get really fine lines as well as reasonably large coverage. It is a gravity paint feed which works really well. 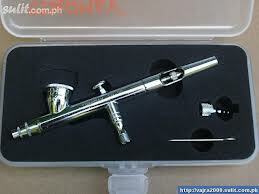 I had previously tried a Paasche VL airbrush which I just didn’t like. A double action airbrush allows you to vary both the airpressure as well as the paint supplied. It takes a little getting used to but allows for much greater flexibility. The Iwata costs more at about $100 but is really worth it and should last a long time. I got it for less on e-bay – I just kept looking for a good deal. I still use the CO2 tank method as it gives me nice dry air and is really quiet – unlike some air compressors. I have to fill up the tank (it’s a 20 pound tank) around once a year. The cost is about $20.00 As with most things – you will get better with practice in your airbrushing. I usually run my brush at about 20 psi. I use this airbrush at pressures from 10 to 20 psi. 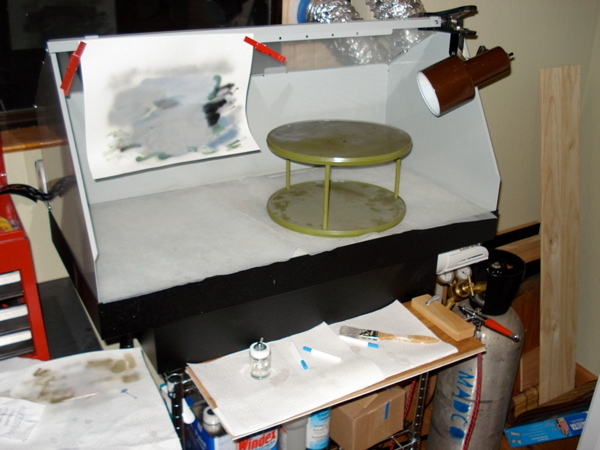 I also now use a spray booth – the cardboard box is gone. The spray booth I have is made by Artograph. It’s their model 1530 and is 30 inches wide. It was a very nice fathers day gift from my dear wife (thanks Teresa!!). It comes with a three stage filter system with fire proof fans so you don’t need to vent to the outside world, or worry about volatile fumes getting ignited by a spark. I can spray now and keep the odors and fumes out of the room – which is really nice. I vent the booth fumes out the window via 3 inch clothes dryer vent pipes. You really need to pay attention to paint fumes. They can give you real headaches at the very least. You want to be around for a long time with a good quality of life – so take care of yourself and make sure that you have adequate ventilation when you are painting. 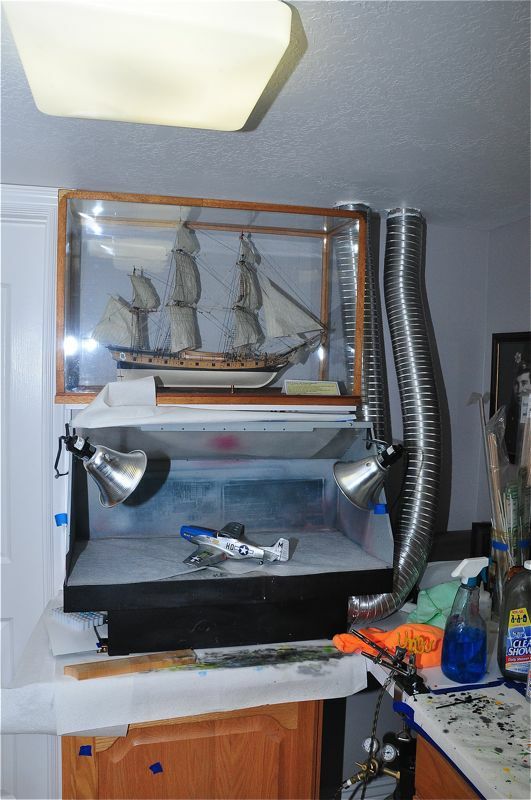 A good spray booth isn’t really a luxury – it’s a necessity if you are airbrushing indoors – even if you are using acrylic paint. I use a couple of stands for airbrushing. I’ve found that you can hold the part with one hand and airbrush with the other, but that can be awkward. You get paint on your fingers and I find it difficult to reach all of the part. It can work ok for larger parts tho. 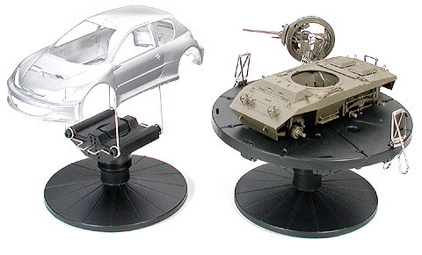 The stands I use came from a spice stand and the Tamiya spray stands – which I really like. I have also just purchased Mr. Almighty Clips II,but haven’t used yet. Here is a pic of my current spray booth setup with the CO2 tank. You can see that the booth is ventilated up through the ceiling – the pipes then proceed to the front of the house where the fumes are vented to the outside. It works very well. It’s really important to keep your airbrush clean. I run Windex then water through mine after each use of acrylic paint. I spray it till the spray comes out clean. I spray into an old Windex bottle (you can see it on the shelf under the spray booth. For enamels I clean the brush with thinner then water. Occasionally I will need to tear the airbrush apart to really clean it. I have found that if you thin the paint down a little more (about the consistency of 0% milk) you will get a better paint job and cleanup is easier as well. 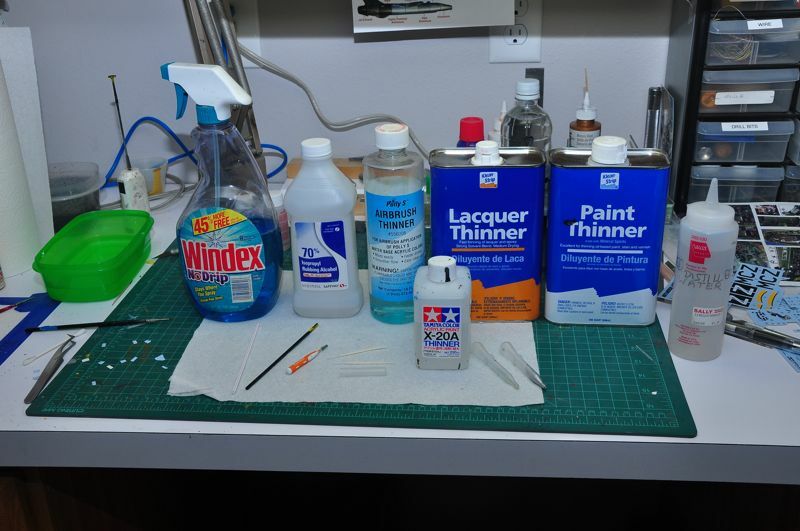 Windex to clean acrylic paint, 70% (99% is better) alcohol for cleaning and paint thinning, Polly’s airbrush thinner, lacquer thinner, paint thinner, distilled water, and in front: cocktail stirring sticks, dental cleaning brushes, water bottle with nice spout top, Tamiya acrylic paint thinner, and liquid suction syringes. One problem I have had is when I pour paint into the airbrush cup. I either dribble paint outside the cup or down the side of the paint bottle – or both. I then have to stop everything and clean up the mess. I have just ordered a nice little item on Ebay that I hope will put an end to all of this. 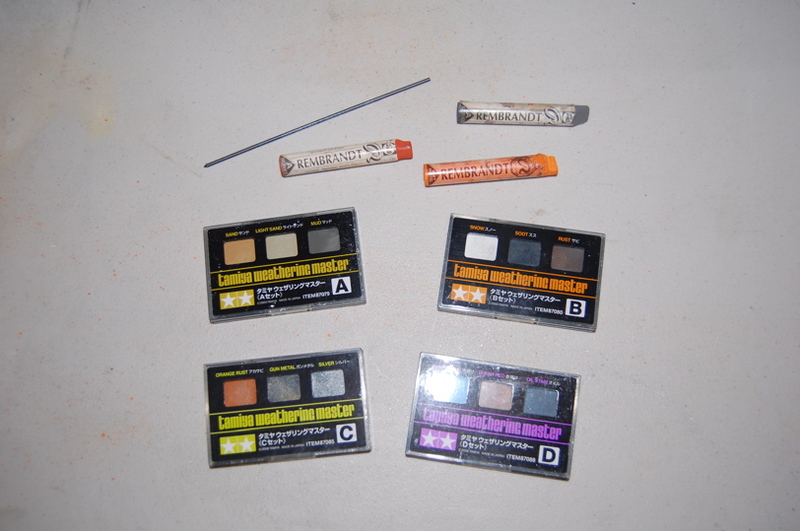 These are – as you can see from the picture – eyedropper pipettes. 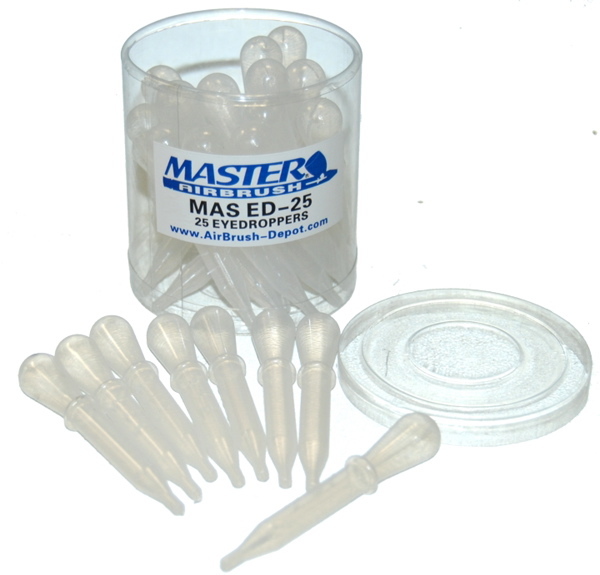 The advertisement says these pipettes are inexpensive, disposable plastic eyedroppers that will take all but the strongest solvents and come with graduations at 0.5, 1.0, 1.5, and 2.0 ml. That is just what I need.